Thousands of people forced to flee the violence in the Central African Republic (CAR) are now facing another humanitarian catastrophe in neighbouring Chad, said Amnesty International. The rainy season is due to start shortly and unless shelter, food and medical facilities are urgently made available their already desperate situation will quickly deteriorate. A delegation from Amnesty International has spent the last two weeks interviewing survivors of violence in CAR and visiting the sites where they are staying along the Chad / CAR border and in the capital N’Djamena. The delegates found thousands of people who had been neglected by the authorities and humanitarian agencies, many suffering from severe malnutrition and with no shelter other than the shade of trees. Among them were a large number of children, many separated from their families in the chaos, and in urgent need of assistance. The rainy season is about to start, rendering many areas inaccessible, and bringing the added threat of waterborne diseases. It is important that the Chadian government and the international community including the UN agencies urgently assist these people and ensure that they have security, access to food, medical services, and adequate shelter. Some of the sites where people are seeking refuge are dangerously close to the ongoing violence in CAR. Having camps so close to the border is also contributing to increasing insecurity and vulnerability of refugees. One woman told Amnesty International that the Seleka commander who had attacked her in CAR had now moved into the camp she had fled to. Another refugee told the organization that he fears for his life after recognising at least four ex-Seleka fighters among the population of the site he was staying in. It is an extremely dangerous situation, and with no security in place it’s just a matter of time before the conflict spreads. The team encountered only a few representatives from the Chadian authorities and humanitarian agencies and most people are forced to fend for themselves. It is now clear that the Chadian government is struggling to cope with the huge numbers of people coming in. It is urgent that the international community coordinates efforts to assist the authorities to avoid a new humanitarian crisis. It is also important that a coherent system is put in place to identify refugees and ensure that they receive the international protection they deserve. The UN Refugee Agency (UNHCR) and the Chadian authorities must coordinate and ensure that the process starts in all sites as soon as possible. 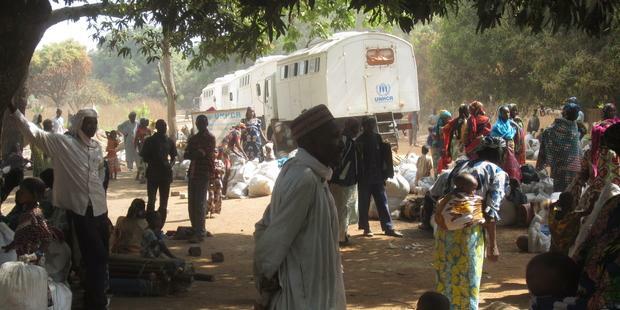 Since December 2013, more than 70,000 people from CAR have registered as refugees in Chad. The Amnesty International delegation conducted more than 200 interviews, in both CAR and Chad over the last three weeks. Amnesty International’s concerns were brought to the attention of the Chadian authorities including at meetings with the Minister of Social affairs and the Minister of Human Rights.